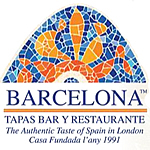 Barcelona Tapas Bar Y Restaurante exclusive Gifts now available to purchase securely online. Personalise a gift voucher, add a message, preview and send it instantly by eMail, SMS Text or 1st Class Post. Dry and rounded with delicate but subtle yeasty tones on the palate. A superb meal for two plus a bottle of white or red D.O.Ca RIOJA BARCELONA SELECCIONE SPECIAL. Deep ruby colour with brick hues, becoming distinctly tawny on the rim. On the nose, intense and very complex aromas: notes of liqueur mixed with hints of leather and damp earth; vanilla and coconut with a background of red berries. If you have a query or special request please call 0845 4900 512.